It’s been the worst-kept secret in Toronto comedy circles for months, but the details of the resurrected Just For Laughs Toronto edition have finally been made public. After skipping 2011 altogether, “JFL42” will return September 21-28, a shift from its previous mid-July home. The city has been a tough nut for JFL to crack marketing-wise. Perhaps suffering from brand confusion among Toronto consumers – who seemed more aware of the annual Just For Laughs Tour, and the famous Montreal edition – the attendance was unpredictable, and seemed to attract fans of specific artists rather than people looking to experience the Festival as a whole. While the “JFL42” moniker doesn’t exactly roll off the tongue, it may be exactly the messaging they need to drum up repeat business throughout the week. Ticketing-wise, the push for consumers to attend multiple shows is a little more obvious. The only way to score tickets to those Louis C.K. shows come Friday is to purchase a $99/$149 all-access pass, available now through http://jfl42.com. 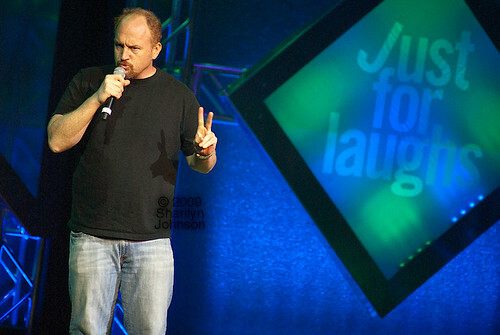 Louis CK at the 2009 edition of Just For Laughs Toronto. Photo by Sharilyn Johnson. It’s an interesting experiment, not dissimilar to the mother ship’s “Zoofest” alt-comedy spinoff that runs concurrent to (and intertwined with) the Montreal edition. For smaller shows, it’s hard to determine how this will work when individual tickets for smaller shows go on sale, and possibly eliminate the spots allocated to all-access passholders. (Often, Zoofest-branded shows sell out completely in advance, leaving Zoofest passholders out of luck.) The JFL42 passes come with “credits” to use for show entries, which will be great for people if those can be used to reserve spots in advance. September will be a busy month for comedy in Toronto: JFL42 overlaps with the annual Dark Comedy Festival, which has already announced Maria Bamford as a headliner.